We’d love your help. Let us know what’s wrong with this preview of Spider-Man by Ramin Zahed. Phil Lord and Christopher Miller, the creative minds behind The Lego Movie and 21 Jump Street, bring their unique talents to a fresh vision of a different Spider-Man Universe, with a groundbreaking visual style that’s the first of its kind. 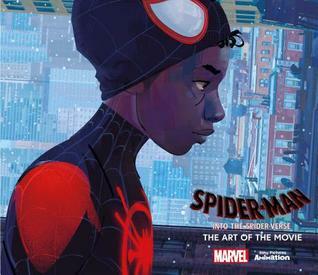 Spider-Man: Into the Spider-Verse introduces Brooklyn teen Miles Morales, and the limitless possibilities of the Spider-Verse where mo Phil Lord and Christopher Miller, the creative minds behind The Lego Movie and 21 Jump Street, bring their unique talents to a fresh vision of a different Spider-Man Universe, with a groundbreaking visual style that’s the first of its kind. Spider-Man: Into the Spider-Verse introduces Brooklyn teen Miles Morales, and the limitless possibilities of the Spider-Verse where more than one wears the mask. To ask other readers questions about Spider-Man, please sign up. The movie WOWED me!! This book just added to that experience. Ramin Zahed truly pulls us into the Spider-Verse via the spoken word and detailed explanations of the artwork that comes to life on the big screen. We are shown how the art, we take fore granted, is a crucial character within its own right. In Spider-Man: Into the Spider-Verse: The Art of the Movie, Zahed reminds us that the art, itself, helps draw us in; develop the story; and guide us through the Spider-Verse. Miles, like every incantation of Spider-Man, is someone whose nose is pressed against the window, wanting to be part of something that they think they’re not a part of. That’s a [sic] universal feeling for all of us. While reading this book and really seeing the art, for the first time, I found myself genuinely appreciating the time and effort that went into creating the film. The book concretely illustrates (no pun intended) a clear understanding about what Miles and his counterparts can mean for this and future generations. ...anyone can wear the mask...It’s up to future generation of this country to stand up and do the right thing. In case you missed it, I highly recommend this book!!! Honestly, one of the best art books in my collection! I love all of the insight it gave to the movie, even though I wish the book itself were longer. I adore this art style and would love an even deeper look into the process of creating this stunning movie! Its a beautiful art book of the movie that takes you deeper into the world of the movie. Everything is so vibrant and beautiful and you can 100% see all the handwork and love that went into everything that was done. It’s a little light on character design, favoring backgrounds and storyboards, and, as always, far too many pictures cross the valley. Some are low-information bits and being a 2/3-1/3 affair it’s not as bad as some other books, but it’s continually baffling why they do this. As with the terrible Aquaman art book, the few foldout pages are devoted to small pictures. In this case, it’s storyboards. What is the point of that? A beautiful book for a beautiful movie. Wonderful pull out pages and great behind the scenes material. An absolute must additon for fans of the movie, Spider-man or both. Really loved looking through all the concept art and reading about all the artists/art movements that influenced this movie though there's a couple things that took it down a star for me. For starters I wish we got more concept art for the character designs. Obviously some characters are more important to the narrative than others, but I think part of the initial appeal of Spider-verse (aside from the animation style) is that we get to see so many different incarnations of Spider-Man and his rog Really loved looking through all the concept art and reading about all the artists/art movements that influenced this movie though there's a couple things that took it down a star for me. For starters I wish we got more concept art for the character designs. Obviously some characters are more important to the narrative than others, but I think part of the initial appeal of Spider-verse (aside from the animation style) is that we get to see so many different incarnations of Spider-Man and his rogues gallery from throughout the multiverse. Seeing more about the alternate Spider-Men, the various costumes, and the villains would have pushed this book from being "great" to "awesome". This also might sound kinda picky, but I wish we got a bit less commentary from the higher-ups like Amy Pascal. Obviously Sony has a right to be proud of this movie and I LOVED the foreword by Brian Michael Bendis (who's apparently a huge fan of books like this), but I think books like this should be where we hear more from the creative minds behind the movie and less from executives. Otherwise it's a fun read and absolutely worth your time. This was a solid offering, but subtly disappointing in a lot of ways.i would have liked to have seen a lot more of the character design, for example. The biggest issue, though, is how self-congratulatory it was from executives and higher ups with little to nothing from the creators who got the whole thing started. No acknowledgement of where all those Easter eggs came from, and while Brian Michael Bendis gets plenty of credit, very few other creators are even mentioned. But also? The innovative, This was a solid offering, but subtly disappointing in a lot of ways.i would have liked to have seen a lot more of the character design, for example. The biggest issue, though, is how self-congratulatory it was from executives and higher ups with little to nothing from the creators who got the whole thing started. No acknowledgement of where all those Easter eggs came from, and while Brian Michael Bendis gets plenty of credit, very few other creators are even mentioned. This is by far one of the best Art Of book I've ever read. Even one of the best art/animation books I've ever read so far! Like I said before, there was just so much passion put into this movie and book and you can just absolutely tell by reading this. I loved reading about how the movie was made and how the team did everything they could to push the animations and art to make it truly like nothing anyone's seen before. And oh boy did they succeed. First: this movie is wonderful and you should go see it immediately. Second: this book is a great look into the unique art style of the movie. If you liked the movie and it's incredible animation, you should definitely pick this up. Easily the most beautiful "Art of -insert movie here- book that I've ever read. Absolutely stunning, just like the movie, and if you haven't watched it already, go do it. If you love the movie, this book won’t let you down! For how gorgeous this movie is, I expected the artwork to be more impressive, but I found this book to be bland.